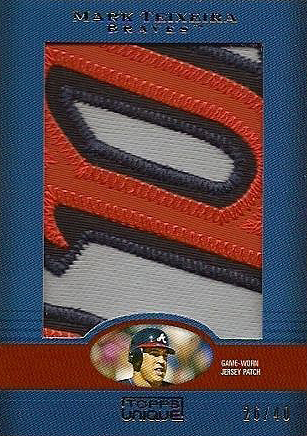 One of the more anticipated Topps products of 2009, Unique, is now live and several singles have hit eBay. Surprisingly, it’s not the “big hits” that have caught my attention but the game-used relics. Below is a small gallery of some of the cards currently on eBay. Take a look at the Miguel Cabrera on the left. It features a tired concept (to me anyway) of a memorabilia card and a very old photo but the design is magnificent. The Mark Teixeira Jumbo patch looks great but there’s certainly nothing “unique” about it, as we’ve seen it multiple times in Topps products from the past few years but the 1/1 Hanley Ramirez laundry tag card is simply amazing. Blowout Cards is pre-selling boxes of Unique for just under $120 dollars. For that price you get some well-designed cards and either one autograph or two game-used relics. As expected, Topps Unique features 100% sticker autographs. If and when the prices of unopened boxes hits closer to $100 dollars, it could be one of the big sellers of the year. Of course, it all depends on what big cards hit eBay in the next few days and what kind of box breaks collectors show off in the forums. How do YOU feel about Unique so far? Please keep in mind that the 2 cards on the right are 1 PER CASE hits. And please tell me you’ve seen the Andrew Miller “patch” card with him STILL in a Tiger’s uniform. How many YEARS has he been with the Marlins now? It’s just as bad as the Miggy, which I mentioned. They were traded for each other so they are both way too old to be featured in a 2009 set. It is sad they are using such odd photos given there should be newer ones but that Miller should be a nice PC addition. I think its because the patch or relic was taken from the jersey they had of that player when they were on that team, I got a Edinson VOLTRON Volquez button/auto with him in a Rangers uniform at the rip party. This will be a steaming pile of crap. I don’t agree with Gellman on ANYTHING except that Topps’ products over $100 are generally garbage. I never understood the allure of the laundry tag cards. Game-worn patches are fun to collect in my mind because it ties you to the player and team, but for the same reason I’m not a huge fan of the MLB logo patches, I’m just not a big fan of the laundry tags. 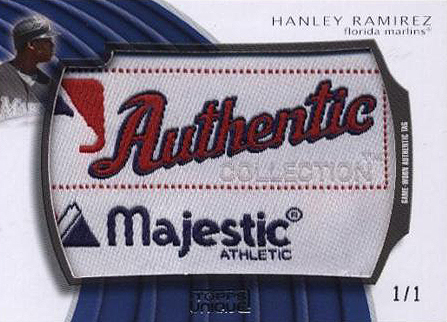 I mean, they’re the same for everyone, even if its “Hanley Ramirez’ Laundry Tag” it is still not indistinguishable. I never purchase entire boxes of stuff like that but if the price per pack is reasonable I may give it a shot. With the new baby I’m quickly seeing the appeal of collating sets: it makes the purchases last longer if you prolong the breaks! Please explain to me why anybody would want a card with a miniscule player photo and a laundry tag? Amazing….no…..boring and ugly….yes. 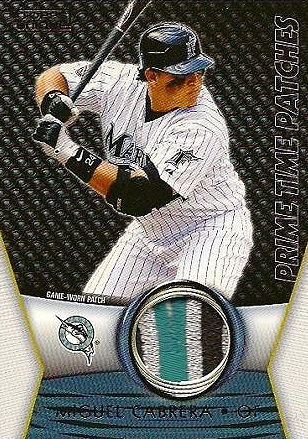 If they’re going to use a Marlins jersey patch, maybe they should use a photo of him in a Marlins uniform. I’ve often heard people complain when the patch and photo don’t match, and I like it when they do. Is the Miller patch the same situation? I saw a Josh Hamilton devil rays patch… uh. He hasn’t been in Tampa’s organization in almost a decade. It is a 10 box case so it not that bad odds wise. I just pre ordered one. Mario you get one Autograph + two relics per box. 3 Hits. that buys high end topps packs. This is not a high-end product. I actually don’t mind it too much that some of the relics and autos are of players with their previous teams. That’s just one (more) way that card makers are a slave to their subjects—Topps acquires relics to use in their products, and they can turn practically obsolete as soon as a day later if the player gets traded or goes free agent. Jerseys seem like they can change like underwear—and I certainly don’t want underwear relics. The lamest thing would be to have a photo of a player with his current team, and include a relic of his old team. I can’t stand those lazy franken-cards in-waiting. An improved touch would be to have the year expressed on the card of the player photo and jersey, assuming that they match, of course. I don’t mind knowing that I would get a Teixeira in a Braves uni. I would just like to know how far back that time tunnel goes. I saw a bunch of this opened yesterday at the shop. 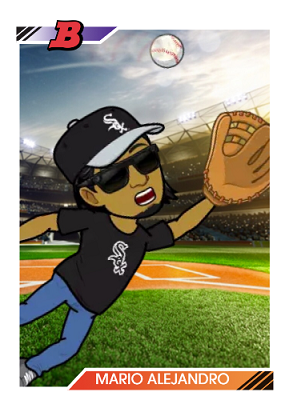 I saw two “unique” cards out of one of the five box cases…a jumbo Cardinals patch of Ryan Ludwick (sp) numbered to 40 and a MLB Logo patch autograph 1/1 of….some guy from the Pirates that none of us have ever heard off. After that and some other boxes I saw I decided to pass. Thats what I have seen. I think the jury is out on this one. Does anybody know if the Authentic Game-Worn Jersey Letter cards (#’d 1/1) are actually worn by the player depicted? I mean if you get an “E” on a card that depicts Kurt Warner….is it actually game-worn by Warner or could it come from somebody else with an “E” in their name?